Are they burying their head in the sand over Lough Neagh? 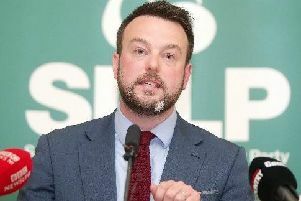 The Environment Minister has been accused of being “complicit” in the ongoing “illegal” sand extraction on Lough Neagh for his failure to stop it. Mark H Durkan has the power to issue an immediate stop notice against the “Earl of Extraction” - as The Sunday Times dubbed him - and the companies he is allowing to take sand from the lough, but hasn’t used it. Speaking to the Mail about the gathering pace at which sand is being taken from Britain’s largest lake and nature reserve, James Orr told the Mail he asked Minister Durkan and Lord Shaftesbury to meet with him to discuss his concerns, but both declined. The Friends of the Earth director said if there is even the slightest indication sand dredging is causing environmental damage, the minister has a legal obligation to stop it as the lough is protected under an EU directive, giving it special status. But when the Mail asked about this, we got the second of two statements from Department of the Environment saying “it is not appropriate to comment” while the Planning Appeals Commission said it must “follow due process”. The minister served an Enforcement Notice on sand traders “illegally” taking sand from Lough Neagh under licenses from mineral rights owner Lord Shaftesbury - Nick Ashley-Cooper in May. But the day before it was due to come into action, those involved appealed - and the extraction allowed to continue pending the outcome. The Planning Appeals Commission said this could take months, as the closing date for all environment statements to be submitted is not until November 27 - the required six-month period. Meanwhile Friends of the Earth has raised concerns that P&J Walls, A&E Mulholland, Norman Emerson Group Ltd, Northstone (NI) Ltd - which posted a 25% increase in turnover to £298m last year - and Lagan Group may have increased extraction activity on the lough as some of the companies’ sand barges - unusually - worked throughout the Twelfth holidays. Lord Shaftesbury was unavailable for comment, however, his company previously released statements saying the sand traders “sought the advice of a number of environmental and scientific experts who have recently conducted several studies on the lough to examine any environmental impact from sand extraction” which did “not reveal anything of any major concern”. Scientific evidence will be considered by the Appeals Commission. A spokesperson for his estate also said he may not have been unable to meet with Friends of the Earth due to the legal situation surrounding the sand extraction. There are between 12 and 15 sand barges operating on the lough, each removing up to 450 tonnes a day. Earl of Shaftesbury, Nick Ashley-Cooper, permits the sand extraction as he owns the mineral rights. The sand traders say the material is vital to Northern Ireland’s construction industry and that jobs are on the line if the supply is lost.